The Eisner Award nominations were announced, and there's a lot to talk about! Then it's on to questions from out Patreon backers. In a social-media landscape that favors branding the creators themselves over their creations, it it OK to have a pen name? And what's the best approach to warm-up sketches? BUT FIRST... Brad hit a monster pothole on a winding Philadelphia thoroughfare, rupturing the tire, forcing him to pull over on a road with no shoulder and wait for AAA Roadside Assistance for over an hour as cars swerved around the curve, narrowly missing collision after collision. And it was his in-laws' car. Read the *next* page of Drive right now! EXCLUSIVE early read of the next Drive is up, only for Patreon backers! 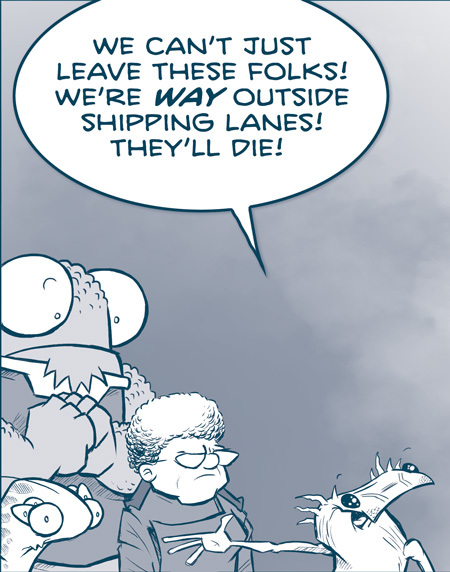 The page is called "Way Outside Shipping Lanes" and here's the link!